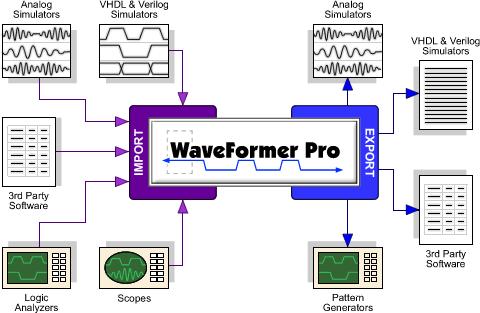 WaveFormer Pro and DataSheet Pro support over 55 different formats for importing and exporting waveform data. Import waveform data from simulators, logic analyzers, and timing analysis programs. Export waveforms to VHDL, Verilog, SPICE, Pattern Generators, ATE, and FPGA tools. These timing diagram editors also ship with a PERL based scripting language that lets engineers create their own import and export scripts to support waveform formats used by custom test equipment and internally developed software. You can write import and export scripts to support waveform formats used by custom test equipment and internally developed software. Also, SynaptiCAD can be hired to write the scripts. Contact us via email: Sales Office and tell us what import/export formats that you would like us to add. Waveperl is an extended version of the Perl language that contains additional functions for creating and manipulating data structures inside WaveFormer. Waveperl scripts are compiled dynamically whenever the script is run and executed by a perl interpreter embedded into WaveFormer. Waveperl scripts are primarily intended to be used for waveform import/export operations, but users can also write scripts to add new editing functions to WaveFormer. Waveperl scripts are normal text files that can be created using your favorite text editor or Notepad. The standard scripts that ship with WaveFormer contain comments that identify the most probable locations for user modifications.For more information about Perl, go to the Perl Language Page.